Summary: Eliminate messy, sticky bathroom sinks forever. 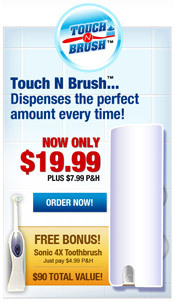 The new Touch N' Brush is the new hands free, mess free toothpaste dispenser. NO MORE Messy sticky bathroom sinks! NO MORE Crusty toothpaste tubes! NO MORE Fighting for the last drop of paste! NO MORE Kids leaving behind a morning mess! Eliminate messy, sticky bathroom sinks forever. 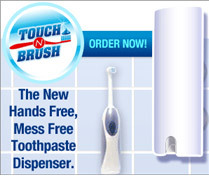 The new Touch N' Brush is the new hands free, mess free toothpaste dispenser. It dispenses the perfect amount every time! No more sticky bathroom sinks, no more crusty toothpaste tubes, no more fighting for the last drop of toothpaste. It's easy to setup and use. Press on the suction cups, insert any kind of toothpaste tube, and slide on the cover. It's that easy! Buy today and get a free Sonic 4x Toothbrush.